Presently Oracle 12c database Release 1 is available for 64bit Windows only. It is also available for Linux and Solaris (64bit) sparc and X86 platform. In this article we can see how to install Oracle 12c database on Windows platform. First you should need to download Oracle 12c database source from official site and unzip it at local drive of computer. Installation task is very easy on Windows but remember this time Oracle changed installation style and feature. There are lots of options added in this installation process. 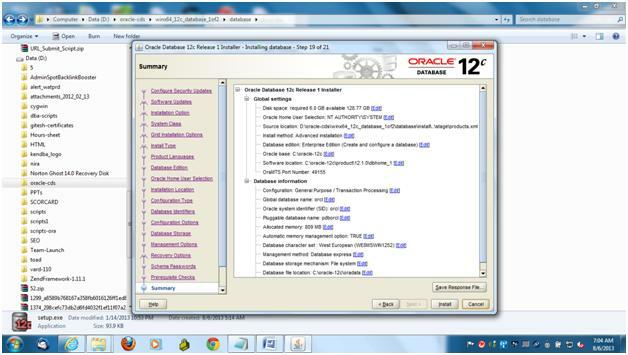 Mainly there are 21 options available for installing Oracle 12c Enterprise Edition database. Those are following. Go to unzipped folder of Oracle 12c source and execute setup.exe. This task will open following installation window for operating system prerequisite checking. After finishing operating system dependency, it will be starting installation process with Oracle GUI installer. At first stage of installation, it gathers all system information. For more detail see screenshot. Now first option is available to provide detail called “Configure Security Updates”. In this option installer asks email id for configuring Oracle Configuration Assistance with Oracle metalink support. If you don’t have support identifier number and want skip this option then select “next” button. After clicking “Next” button and don’t provide any information in above step, Oracle installer will give you error message as screenshot. You need to ignore this error message. Just click on “Yes” button and go to next option. Next option is “Software Update” stage. In this option, again Oracle asks about Oracle patch update and this is also part of Oracle Configuration Assistant for linking account with Oracle support portal. If you don’t want to provide any detail or you don’t have Oracle support then select “Skip” option button and go ahead as per screenshot. In this stage, Oracle would ask you about New database creation and upgrade existing database. If you want to install only software then you can select same option. But in this step by step installation guidance we selected “Create and Configure New Database” option and click on next button. In this stage, installer will ask about which type of installation is being performed like do you want to install database server or laptop edition. You will get 2 options here as given screenshot. First is “Desktop Class” where Oracle installs with starter database with minimum features because in laptop or home pc doesn’t have too much resources. Second option is “Server Class” and in this option Oracle would install all advance features. This is new feature in Oracle 12c installation process. In previous versions, If you have installed clustering then and only Oracle enables this option because it would ask about single instance installation (default) or Oracle Real Application Cluster installation with multiple instances as per given screenshot. I selected “Single Instance Database Installation”. This is same feature available in previous version of Oracle. In this stage, you can choose Typical installation or Advanced installation. In typical installation feature, it will install all features with pre-configured database without any customization. In advanced installation stage, you can choose every configuration stage and customize it. For more information, check screenshot of same. This stage is likely to operating system installation which was not available in previous version of Oracle. In this stage, we can select language. In this demo guidance, I selected English(United Kingdom). During this language selection, you can select multiple languages too as per screenshot. This stage of installation was available at previous Oracle version. For Oracle DBA, this stage is most important because it is directly connecting with your Oracle license. You can choose Enterprise, Standard, Standard One, Personal database edition for installing. Concept is same as previous Oracle versions. For more detail check screenshot. In this installation stage, you need to specify Windows user. You have 3 options available for selecting. First is “Use existing Windows User”. You need to provide existing user detail including password. Second option is “Create new Windows User”. You should need to give new username and password. Third option is “Use Windows Built-in Account”. In this option, Oracle will use existing and logged in user account for installing Oracle software and provide ownership of software to same user. In this demo, I selected 3rd option as per screenshot. Specify Oracle Base directory location for creating Oracle configuration files, inventory, etc files and also provide Oracle home directory location for installing Oracle software files. This option doesn’t new because it is also available in previous versions. This option only available if “new database creation” with “advanced installation”. You need to specify database configuration type like General, OLTP, Online Transaction processing, data warehousing purpose. This option is very easy to manage. You could provide new database name with global name in this stage. Oracle 12c database has new feature called as Pluggable database. If you want to create new pluggable database for learning purpose then you can provide name of pluggable database in this stage. Means Oracle will create 2 databases. One is container (main) database and one is pluggable database. This option is having more sub configurations. This is part of new database parameter setting, NLS setting, Memory setting. If you want sample schema then you can configure in this stage. This stage is like DBCA (database configuration Assistant). For more detail check screenshot. In this stage, you need to select location of new database creation. In short, you need to specify one location for all data files, control files, redo log files. In this option you can select ASM storage too. For more detail check screenshot of this stage. In this stage of installation, you need to provide detail of Enterprise Manager Cloud control. If you want to configure this installation with Oracle Enterprise Manager Cloud control option then you need to provide OMS Host and Port with Enterprise Manager login credential. If you don’t want to configure Enterprise Manager cloud control then you can skip this option and click on Next button. This option enables flashback recovery with archive logs. If you don’t want to enable this option at installation time then you can skip this stage. See screenshot of same. Because you can enable same option later on. Just click on Next button. During this stage, you can provide different password for SYS, SYSTEM, DBSNMP, and PDBADMIN users. PDBADMIN is new user in Oracle 12c for administrating pluggable database. You can also provide single password for all default schema. For more detail check screenshot. This is mandatory stage. You need to choose one of option and provide password detail. After providing all of above details, Oracle installer would check every configuration including diskspace, storage, memory, swap size. If anything found wrong then you would get error message during this stage. You don’t need to do anything if no error throwing. After finishing prerequisite checks, Oracle will show you summary page of all above configuration and selection of options for installing. In this section you can rectify any of misconfiguration or wrong selection and correct it. During Summary stage, if you choose button of “Install” then Oracle starts installation process and in Install product phase, you can get process updating status as per screenshot. During install product stage, you have option to check “Detail” of installation progress. As per attached screenshot, you would get result of detail of installation progress. Finally, Oracle installation will be finishing with new database creation including pluggable database.